Chad Campbell, PSI Racing, .165 reaction time, 10.23 (10.20 dial) 127.01 mph def Terry Phillips, DT Embroider;y, .033, 15.00 (10.18 dial) 70.76. Quarter-Jerry Trolard, Melba Outlaws; Rick Sayers, Melba Outlaws; Steve Pyburn, Melba Outlaws. Rose Shaw, Naughty Girls, .005, 11.86 (11.70 dial) 102.95 def. Andrea Higgins, Melba Outlaws, .119, 12.16 (12.05 dial) 106.49. Semi-Rachel Rush, Kuna Knuckle Draggers. 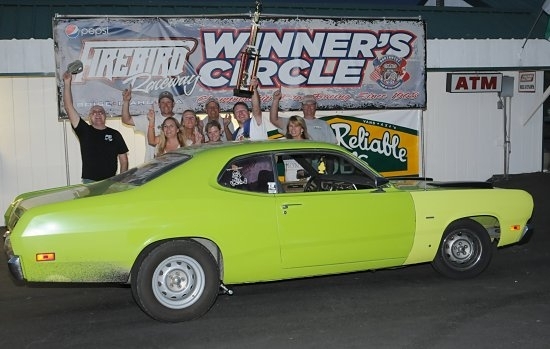 Quarter-Clyde Hughes, Mopar Mafia; Jim Shadwick, AMC Racing; Brady Jesser, Flying Brick. Catherine Seamons, Kuna Knuckle Draggers, .009, 13.21 (13.28 dial( 101.19 def. Chris Jaggers, PSI Racing, .069, 14.31 (14.32 dial) 92.64. Semi-Lee Zimmerman, Down `n Dirty. Quarter-Mike Ritz, Valley Vettes; Tessa Lancaster, Naughty Girls. Dean Vandewater, Down N Dirty, .227, 15.32(14.65 dial) 85.55 def. Eric Andersen, Venom Racing, -.161 foul, 13.73 (13.67 dial) 104.46. Quarter-Pam Zollinger, Naughty Girls; Jeff Fetty, Doorslammers. Jim Bennett, Mopar Mafia, .026, 16.56(16.50 dial) 77.04. def. Mike Huetson, Down N Dirty, .277, 15.61 (15.60 dial) 89.39. Quarter-Randy Lyons, Modern Rodders; Bruce Glascock, Melba Outlaws; Neil Ramey, DT Embroidery. Ed Cutler, .009, 9.28 (9.28 dial) 145.58 def. Juliet Barnhart, .069, 7.92 (7.88 dial) 167.22. Quarter-Mark Barnhart; Chris Jaggers; Cody Hiatt. Eighth-Christopher Northup; Steve Reynolds; Randy Bullington; J.R. Cox’ Duston Wurtz; Dan Doersch; Judy Radford. Troy Pecht, Caldwell, .033, 10.08 (10.07 dial) 126.49 def. Joe Witherspoon, Caldwell, .033, 10.97 (10.93 dial) 121.06. Quarter-Mike Drummond; Bruce Compton; Vern Chitwood. Eighth-Kristi Shawver; Alex Smith; Sue Reynolds; Ken Windley; Carl Youngstrom. Craig Jensen, .087, 9.68 (9.71 dial) 130.83 def. Scott Grondahl, .172, 9.88 (9.99 dial) 130.73. Quarter-David Wood; Jacob Wood; Chad Hofert. Eighth-Rich Pedraza; Courtney Smith; Don Trafford; Deb Bittick; Chase Bittick. Luke Jacobson, .059, 12.52 (12.53 dial) 104.59 def. Tyler Rush, .053, 12.96 (12.98 dial) 100.96. Quarter-Patsy Lindbloom; Lee Zimmerman; Steve Shideler. Eighth-Glen Phillips; Shawn Nyquist; Lindsey Burlile; Jeff Fetty; Katy Sterling; Margaret Smith. Chandler Steen, .000, 8.06 (8.04 dial) 79.81 def. Michael Jaggers, .108, 8.42 (8.41 dial) 75.32. Quarter-Paul Sheridan; Rion Coates; Jacob Geier. Ryan Resinkin, .066, 11.12 (11.10 dial) 110.44 def. Catherine Seamons, .082, 13.09 (13.03 dial) 104.71. Quarter-Carl Youngstrom; Joseph Karnes; Mike Ritz. Jim Coryat, .060, 9.35 (9.32 dial) 130.07 def. Carl Youngstrom, .158, 10.30 (10.27 dial) 122.56. Quarter-Denise Clark; Bryce Wikfors; Pamela Lottman; Doug Wikfors. Chad Hofert, .084, 9.21 (9.10 dial) 147.61 def. Scott Grondahl, .110, 9.98 (10.06 dial) 135.68. Ashton Davis, .157, 18.17 (18.15 dial) 75.47 def. Kristi Shawver, .324, 13.63 (13.65 dial) 94.88. Quarter-Kristin Forrey; Perry Hammons; Dustin Davis. Carl Youngstrom, .052, 13.81 (13.88 dial) 95.90 def. Glen Phillips, .122, 12.59 (12.74 dial) 109.27. 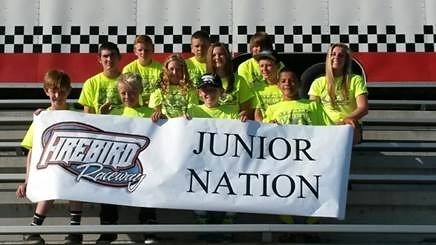 Here is a recap of Junior Nation at the NHRA Western Conference Finals. Wednesday was our first race day. It was a day of index racing on a pro tree. A first for many of the kids! Rion Coates made it to the quarterfinals in his class and Paige ended up one of the final 5 cars out of a field of 80 in the 7.90 class. Thursday was a great day for the Firebird team. This was a day of age group racing and some of these classes were huge. Layne Fiscus went to the quarter finals in the 8-9 year bracket, Austin Coates did an amazing job and was runner up in the 11 year old class and Michael Jaggers brings home the big win in the 15 year old class!! Friday offered more “age division” racing with a half scale car, an engine and clutches on the line for the final 4 winners of the day (which ended up being all female drivers)! Paige Harris made it to the semi finals in the age 13 bracket. Not a lot of rounds for Team Firebird on Friday, but some of the kids who went out early headed off to Lagoon for some fun! Saturday was the big day. The coveted Wally trophy was on the line for the national event. Justin Hof and Jacob Geier represented our team well this day. Jacob made it to the quarter finals in the 15 year old bracket, and Justin made it to the quarter finals in the 13 year old bracket. Both boys walked away with some bonus money in their pocket for a good day on the track. Justin was also awarded a trophy for being closest to his dial in round 1 for his age group. He went 7.90 on a 7.90. Can’t get any better than that! Jake Montgomery, Nampa, .179, 11.15, 112.71 def. Rory Baldery, Boise, .310, 11.09, 125.57. Javier Castro, Nampa, .087, 13.909 (13.70 dial) 104.88 def. Tyler Fuentes, Nampa, -.002 foul, 11.55 (11.60 dial) 120.16. Rich Pedraza, Boise, .129, 15.22 (14.89 dial) 84.49 def. Mike Dome, Boise, .403, 14.44 (14.35 dial) 90.00. Aaron McCoy, Meridian, .072, 17.89 (17.85 dial) 70.77 def. Cody Romero, Boise, .235, 15.98 (15.95 dial) 85.73. Mike Smith, Kuna, .159, 12.18 (12.16 dial) 107.10 def. David Kletzien, Boise, .138, 9.69 (9.59 dial) 143.51. Cory Alberts, Nampa, .137, 13.90 (13.65 dial) 96.16 def. Catherine Seamons, Kuna, .122, 13.53 (13.20 dial) 101.01. 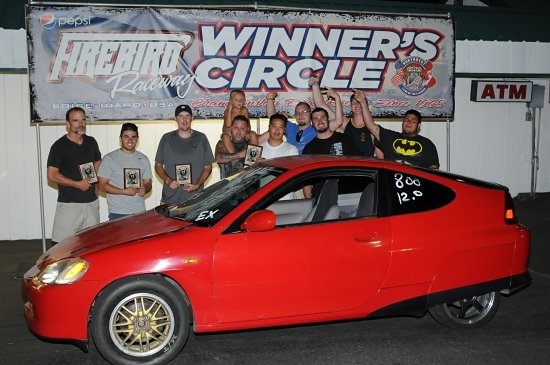 Show `n Shine: Hai Tran, Hottest Honda; Armin Salkik, Trickest Acura; Chad Hofert, Allen Martinson, Best of the Rest; Bubba Gomez, Lowest Entry; Micahel Davis, Use of Color; Dusten Foster, Out of Sight Engine. Steve Pyburn, Melba Outlaws, .072, 10.28 (10.29 dial) def. Daniel Brown, Melba Outlaws, .140, 11.12 (11.16 dial) 114.67. Quarter-finals-Joe Witherspoon, Door Slammers; Rick Sayers, Melba Outlaws; Terry Phillips, DT Embroidery. Bret Ward, PSI Racing, .034, 12.67 (12.68 dial) 110.30 def. Lucas Hull, Melba Outlaws, .078, 12.41 (12.51 dial)103.14. Quarter-finals-Greg Sabatino, Down `n Dirty; Randy Morrell, Venom Racing. Tyler Rush, Kuna Knuckle Draggers, .053, 13.12 (13.17 dial) 100.14 def. Travis Sterling, Door Slammers, -.100 foul, 15.47 (15.32 dial) 80.17. Semi-finalists-Kyle Witherspoon, Down `n Dirty. Quarter-finals-Troy McDonald, The A-Team; Richard Rush, Kuna Knuckle Draggers. Sabra Rasmussen, Melba Outlaws, .073, 13.73 (13.72 dial) 93.75 def. Andrea Higgins, Melba Outlaws, .083, 14.90 (14.82 dial) 95.18. 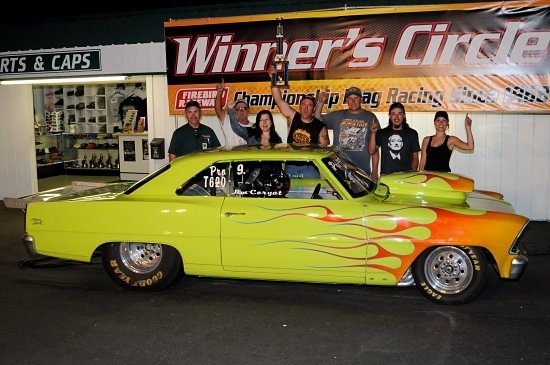 Quarter-finals-Chance Bennett, Mopar Mafia; Angela Cirelli, Flying Brick. Robert Johnson, AMC Racing, .082, 17.09 (16.98 dial) 76.63 def. Jon Anderson, Venom Racing, .107, 18.44 (18.30 dial) 81.12. 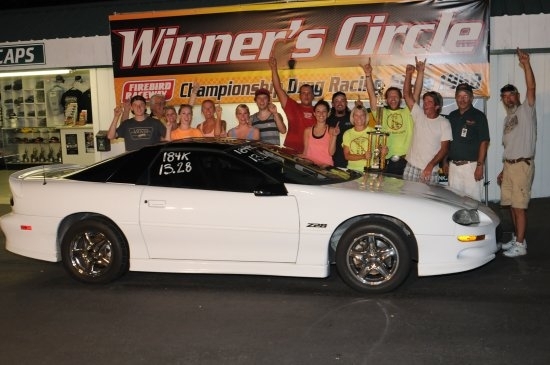 Quarter-finals-Earl McCollough, Melba Outlaws; Eric Anderson, Venom Racing. Tyler Rush, Star, .043, 13.32 (13.23 dial) 96.21 def. Dan Wilder, Caldwell, .052, 11.49 (11.39 dial) 116.41. Semi-Chase Bittick, Middleton; Duston Wurtz, Meridian. Duston Wurtz, Meridian, .021, 8.37 (8.37 dial) 155.87 def. Ed Cutler, Meridian, .013, 9.47 (9.43 dial) 142.56. Semi-finalist-Mark Barnhart, Emmett; Cody Hiatt, Boise. Quarter-Trevor Murdock, Meridian; Shayne Schaefer, Boise; Mike Coltrin, Boise. Eighth-Sean Shaffer, Boise; Juliet Barnhart, Emmett; Larry Saunders, Fruitland; Judy Radford, Baker City, Ore.; Eddie Franek, Payette; Wes Barnard, Wilder; Troy Thomas, Meridian. Dan Wilder, Caldwell, .055, 11.42 (11.45 dial) 117.09 def. David Deming, Nampa, -.006 foul, 10.73 (10.72 dial) 117.14. Quarter-Mick Alley, Eagle; Stan Deming, Nampa: Chad Campbell, Meridian. Eighth-Seth McLean, Nampa; Zak Pedraza, Boise; Travis Bowins, Meridian; Michael Wallacew, Emmett; Phil Sielaff, Pine. Chase Bittick, Middleton, .022, 11.17 (11.06 dial) 111.66 def. Jacob Wood, Meridian, .103, 9.35 (9.28 dial) 137.69. Tyler Rush, Star, .101, 13.55 (13.30 dial) 80.04 def. Bryne Bowins, Meridian, .413, 15.59 (15.35 dial) 90.14. Semi-finalist-Joseph Karnes, Boise; Lucas Hull, Middleton. Quarter-Mike Osmus, Caldwell; Rachel Rush, Boise; Tom Ash, Parma. Michael Jaggers, Middleton, .096, 8.45 (8.38 dial) 73.40 def. Justin Hof, Nampa, .176, 8.08 (7.98 dial) 77.22. Semi-finalist-Chandler Steen, Idaho Falls; Casey Compton, Boise. 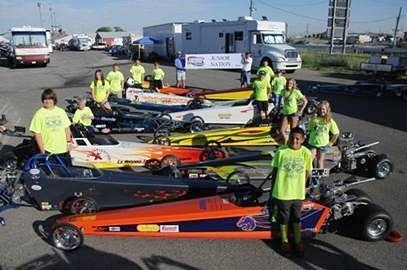 Quarter-Layne Fiscus, Boise; Rion Coates, Eagle; Jessica, Segura, Caldwell. Tim Shaw, Boise, .143, 10.31 (10.32 dial) 129.36 def. Terry Hall, Nampa, -.056, 12.34 (12.45 dial) 112.51. John Smith, Ontario, Ore., .032, 10.45 (10.46 dial) 126.42 def. Dan Fawcett, Blackfoot, .075, 11.71 (11.95 dial). Clyde Hughes, Nampa, .148, 12.47 (12.46 dial) 107.73 def. Hons Vandermeer, Boise, .092, 13.97 (13.89 dial) 98.37. Semi-finalist-Ashton Davis, Middleton; Jim Shadwick, Nampa. 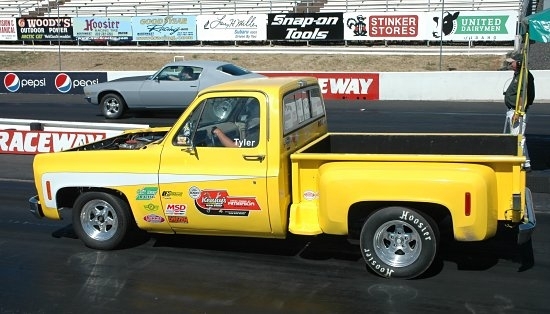 Kirk Bledsoe (Best A/E Body); Dennis Radford (Best B-Body); Russ Hoff (Best Truck); Sandra Francke (Most Original); Richard Williams (Best Race Car); Hons Vandermeer (In Progress); Judy Radford (Fastest Slicks); Tim Shaw (Fastest Street Tires); Norma Petty (Club Pick); Tim Jaszkowiak (Outstanding Hemi); Bobby Scroggins (Outstanding Mopar Engine); Ken Casteel (Outstanding Paint); Doug Wikfors (Outstanding Undercarriage); and Jon Percy (Best of Show). Mike Coltrin, Boise, .023, 9.69 (9.68 dial) 156.35 def. Clayton Steen, Idaho Falls, .150, 7.60 (7.58 dial) 176.22. Semi-finalist-Ed Cutler, Meridian; Steve Reynolds, Nampa. Quarter-Cody Hiatt, Boise; Duston Wurtz, Meridian; Sean Shaffer. Eighth-John Shaffer, Boise; Darrell Carr, Fruitland; Brad Pattan, Emmett; Jim Cox, Weiser; Trevor Murdock, Meridian; Mark Barnhart, Emmett. Troy Pecht, Caldwell, .072, 10.09 (10.11 dial) 131.59 def. James Bennett, Boise, -.003 foul, 9.47 (9.50 dial) 140.73. Quarter-Kristi Shawver, Meridian; Todd Porter, Rigby; Rick Sayers, Middleton. Eighth-Terry Phillips, Emmett; Alex Steen, Idaho Falls; Lisa Thomas, Meridian; Liana Compton, Boise; Richard Williams, Middleton; Levi Burlile, Nampa. Danny Eck, Ashton, .027, 10.56 (10.50 dial) 111.13 def. Jacob Wood, Meridian, .122, 9.08 (9.02 dial) 142.11. Quarter-Mike Smith, Kuna; Don Trafford, Nampa. Eighth-Craig Jensen, Chubbuck; David Wood, Eagle; Brian Wilkening, Buffalo, Wyo. ; Chase Bittick, Middleton; Michael Watts, Boise. Perry Hammons, Caldwell, .013, 15.62 (15.65 dial) 88.73 def. Tyler Rush, Star, .052, 13.15 (13.18 dial) 97.45. Semi-finalist-Lynde Fischer, Nampa; Steve Shideler, Meridian. Quarter-Travis Bowins, Nampa; Jake McNamara, Boise; Ashton Davis, Middleton; Joseph Karnes, Boise. Eighth-Lucas Hull, Middleton; Richard Lally, Boise; Kyle Perkins, Mtn. Home; Rachel Rush, Boise; Margaret Smith, Parma; Don Bruce, Star; Patsy Lindbloom, Eagle. Casey Compton, Boise, .144, 7.95 (7.94 dial) 80.81 def. Jacob Geier, Nampa, .126, 8.12 (8.06 dial) 81.78. Semi-finalist-John Burke Jr., Bates, Ore.
Quarter-Hannah VanderMeer, Nampa; Levi Burke, Bates, Ore.; Justin Hof, Nampa. Adam Anderson, .169, 8.92, 157.53 def. Troy Lind, Meridian, .066, 11.62, 87.31. Rick Sayers, Middleton, .059, 10.41, 125.22 def. Carl Youngstrom, Caldwell, .169, 10.33, 122.41. Semi-finalist-Rick Gray, Rigby; Greg Buckert, Star. Debbie Phillips, Emmett, .097, 11.51, 116.77 def. Carl Klint, Mtn. Home, .090, 11.54, 117.64. Semi-finalist-Scott King, Eagle; Marcia Randall, Emmett. James Higgins, Nampa, .090, 12.05, 109.98 def. Sharlene Lancaster, Payette, -.003 foul, 11.79, 113.62. Semi-finalist-Travis Bowins, Meridian, Brad Pattan, Emmett. Tim Douglas, Meridian, .038, 12.52, 98.77 def. Susan Wikfors, Eagle, .033, 12.61, 106.24. Semi-finalist-Carl Youngstrom, Caldwell; Casey Hart, Meridian. Jason Shipp, Boise, .058, 13.04, 98.76 def. Travis Sterling, Caldwell, .100, 13.08, 106.40. Semi-finalist-Rick Sayers Jr., Nampa; Bret Ward, Boise. Carla Greenough, Idaho Falls, .085, 10.94 (10.90 dial) 110.85 def. Richard Lally, Boise, .157, 12.52 (12.48 dial) 105.93. Semi-finalist-Josh Campbell, Boise; Triston Young, Middleton. 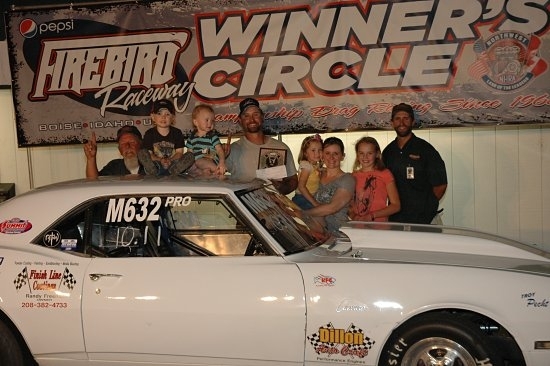 Hans Vandermeer (`66 Coronet); Carla Greenough (`88 Mustang); Troy Lind (`71 Chevelle); Keith Rittenberry (`66 Chevy II); Scott Rowland (`72 Skylark).